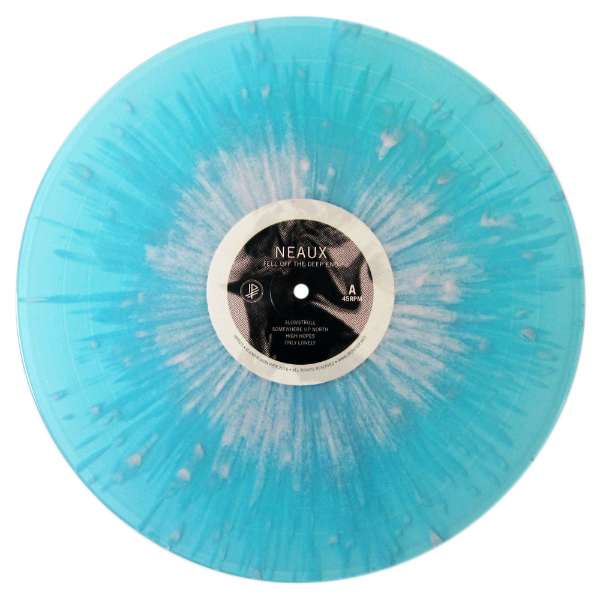 The first press was released on two colorways: transparent electric blue vinyl with hot pink splatter in a run of 186 copies, and on transparent coke bottle green vinyl in a run of 291 copies. The pink in the splatter was chosen to mirror the shade of pink used in the outer/inner sleeve designs and on the color vinyl center labels as well as to provide a visual through-line to all the different elements of the vinyl package. The blue vinyl base color was chosen to break from the other, more floral, colors in the outer sleeve and to highlight the pink splatter. The green colorway was chosen because of its similarity to jade green and to channel the green color of the front cover flower stems. The outer jacket features a photo taken and distorted by the band then updated for the re-release by frequent Iron Pier collaborator Sam Phipps of Iamsam Design. He created a distinctive new take on the original cassette cover art, featuring an all-over halftone screen with cover title text blended and layered into the art. We manufactured this vinyl record and its packaging in the EU using our friends SOLID MFG. The outer jacket is printed full color CMYK on 300gsm white/white standard carton board stock. Our EU plant used a two-fold box spine on all three sides of the jacket, a technique we really like. 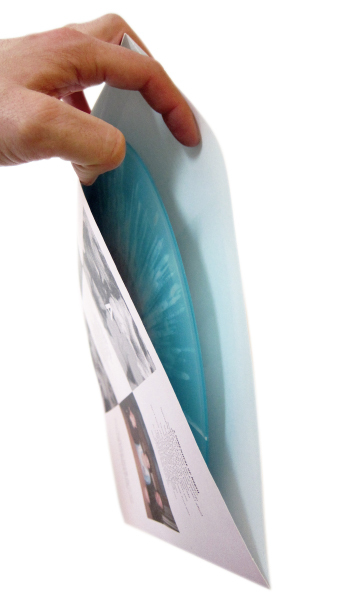 The vinyl record is housed inside an inner printed dust sleeve. When done well, we think a printed inner sleeve can add a really cool feel to a record and we much prefer them over an insert and white paper dust sleeve combo– in fact all Iron Pier vinyl releases since Self Defense Family's Duets have featured a printed inner sleeve. 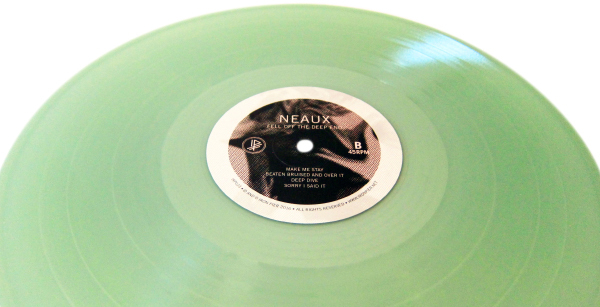 The inner sleeve for the Neaux record was printed on 200gsm offset paper for a thick matte feel. 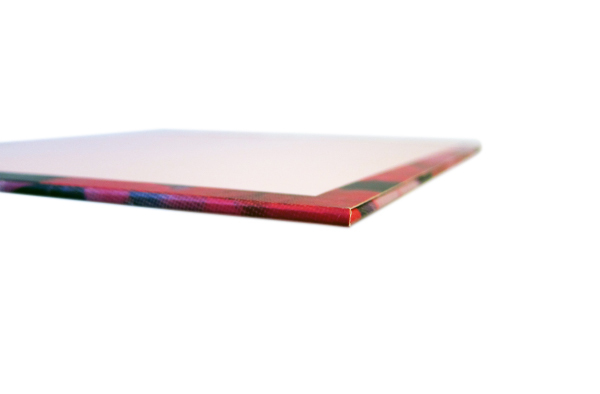 Our plant uses a euro board sleeve design, which often features a thicker stock than typical American paper inner sleeves, with no lip at the loading edge of the sleeve. The pink of the inner sleeve matches the pink on the outer jacket and the pink on the blue splatter vinyl. 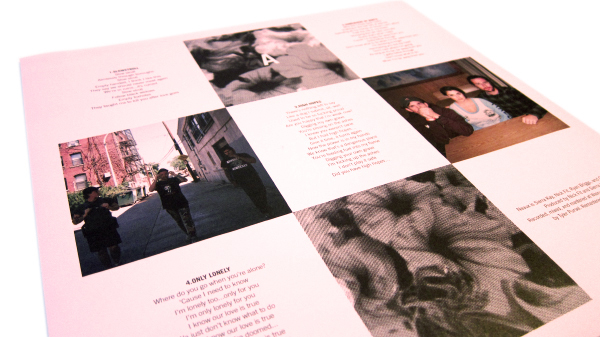 The design on the inner sleeve features photos of the band on tour, repeated elements of the cover art, and lyrics/credits. The inner sleeve is top-loading and the outer jacket is side-loading. We also had black/white inner download cards (not pictured) printed, cut, and inserted into the outer sleeve along with the record and inner sleeve before the whole package was shrinkwrapped, promo stickers applied to the outer front cover, and the records shipped out into the world. These records are now available from our webstore, from the band, and at quality record stores, distros, and online marketplaces.